This Saturday, tens (if not hundreds) of thousands of people will take to the streets in a global day of action against the banks. Here is why we march. The fall of discontent has begun. This Saturday, September 17th, tens (if not hundreds) of thousands of people will take to the streets and squares of financial districts in dozens of cities around the world in a global day of action against the excessive power of the banking sector -- and for a more just, more stable, and more sustainable global financial system. On this exciting day, we will march, squat, block and occupy the physical domain of the financial terrorists who got us into this mess in the first place, and who have since kept the world enthralled to their self-interested prescription of brutally anti-social austerity measures. On this day, we will agitate against the giant vampire squid that, as Matt Taibbi so powerfully illustrated, continues to live parasitically off our economy, blatantly undermining the most basic principles of our democracy and social welfare system. But our actions will not be merely antagonistic. We take to the streets and squares because we believe that another world is possible -- a world in which the interests of the people are upheld as the highest possible good; a world in which capital is equitably redistributed to where it is most needed; a world in which banks promote thrift, not profligacy; a world in which corrupt financial elites are held to account for their criminal behavior; a world in which the financial industry is subservient to the real job-creating economy; and a world in which governments are accountable to their people, not to the banksters. But in order to realize this vision, we need to unite across borders. As Slavoj Žižek once put it, “the reply to every crisis should be more internationalist and universalist than the universality of global capital.” To celebrate the beauty of transnational mobilization and to be a part of this historical moment, ROAR will join the much-anticipated action in Paris, which will be a particularly special occasion as hundreds of indignados are scheduled to arrive in the French capital this weekend as part of their long march from Madrid to Brussels. The marcha popular a Bruselas, which brings together activists from Spain, Italy, France, Greece and numerous other countries, will join thousands of French indignés for a march to the Bastille, passing the Banque de France along the way. 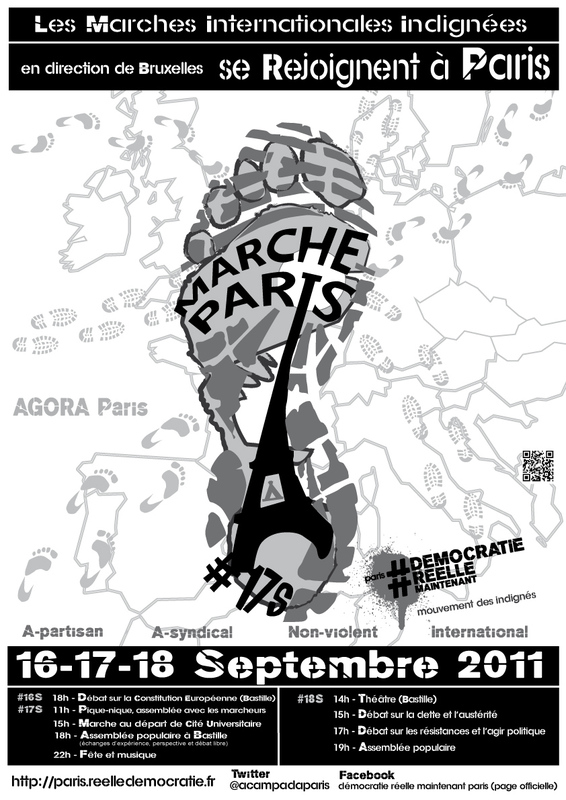 At the same time, activists around the world, coordinated by open-ended and fully autonomous platforms like Take the Square, European Revolution and US Day of Rage, have been building momentum for Tahrir-style tent camps in the financial districts of dozens of cities around the world -- from Athens to Amsterdam, from Madrid to Montréal and from Tel Aviv to Toronto. All of this will culminate in what is undoubtedly to be the most spectacular and most anticipated event of all: the attempted occupation of Wall Street following a call-to-action by the culture jammers at Adbusters. As it turns out, the anti-banks demonstrations of September 17 could not have been timed better: as the “first world” turns another dark page in the modern-day tragedy of its rapidly escalating debt crisis, Western banks and governments suddenly find themselves staring into the abyss. Ever since S&P's downgrade of the US credit rating, trust on financial markets appears to have all but evaporated, and speculators have been making a run on governments and banks alike. Some experts now believe it will only be a matter of weeks (even days!) before wealthy banksters are once again “forced” to extend their begging bowl to the average citizen. Just three years after the multi-trillion dollar bank bailouts of 2008 narrowly averted the total collapse of the global financial system, the situation looks just as gloomy as it did surrounding the collapse of Lehman Brothers. A month-long bloodbath on global stock markets has seen the value of some of the world’s most powerful banks -- the very core of the global capitalist economy -- decimated on a near-daily basis. Bank of America, for example, the largest bank in the US, lost over half of its stock value this year, at one point losing a whopping 20 percent in a single day of trading. Meanwhile, the European debt crisis has finally been revealed for what it always already was: a banking crisis resulting from reckless lending to countries that -- given their exorbitant debt levels and anemic growth -- would clearly be incapable of repaying those loans in the first place. Just like the American banks that so greedily bought up subprime mortgage-backed securities, European banks overextended themselves on “subprime” bonds from peripheral economies, like Greece, Ireland and Portugal. This was never just a fiscal problem for the "lazy workers" of the European periphery, as the populists would have it -- this was a European banking crisis all along. Those in power just tried really hard to keep us from realizing it, by framing the discourse on the crisis in terms of Protestant moralism and nationalist superiority. But this week, French banks, which were the most avid consumers of Greek debt, finally found themselves sucked into the turmoil, their stock value virtually evaporating overnight. Moody’s just downgraded the credit rating of Société Générale and Crédit Agricole, the country’s second and third largest bank, respectively, while the largest -- BNP Paribas -- has been put on review for a downgrade. President Sarkozy felt obliged to reiterate his support for the oligarchs: never would the pinnacles of French capitalism be allowed to fail, he said, even though the total assets of just these three banks amounts to a whopping 236 percent of the country’s GDP. In the meantime, the Federal Reserve and European Central Bank have been buying up so many ‘toxic assets’ (the Fed in the form of mortgage-backed securities that no one knows the real value of; the ECB in the form of peripheral bonds) that even the two paragons of Western capitalism are now facing insolvency. Indeed, if the value of those securities were to fall 6 percent, the Fed could be tipped into bankruptcy, while a drop of 4.25 percent in the ECB’s asset base would literally lead to its demise. Since the inevitable Greek default will already chip off a lousy 2.5 to 3.7 percent, this no longer seems like a distant possibility but an actual threat. Once again, tax payers will be forced to step in, this time to save the central bankers. So why, you may ask, are we mobilizing again? Who cares? And what difference will it make? Well, the truth is that no one knows who cares and what difference it will make until we actually do it -- and that's exactly why we are doing it. It is not only our right but our duty to stand up in the face of such blatant injustice; to defend our democracy from the financial interests that are trying to hijack it for personal gain; to propose an alternative at a time when we are being falsely told that there is none. We are mobilizing on September 17 because we know that the total cost of saving the US banking sector was higher than the total cost of WWI, WWII, the Korean War, the Vietnam War, the New Deal, the Marshall Plan and the Apollo Project, all added together and adjusted for inflation; and we know that the people are now being made to pay for that through years and years of austerity measures -- while the bankers themselves are getting away unscathed. We are mobilizing because we know that Gary D. Cohn, president of Goldman Sachs, personally flew to Athens and conspired with the conservative government there in order to embezzle Greece's true debt levels. And, yes, we know that the Greek bailout was never there to help the Greek people, but rather served as an indirect subsidy to the European banks that had overextended themselves on Greek bonds in the lead-up to the crisis. We are mobilizing because we know, furthermore, that Goldman Sachs was the second largest contributor to Barack Obama’s election campaign, and because we know that Joseph Ackermann, the head of Deutsche Bank and the Institute of International Finance, is a leading economic advisor to Angela Merkel. 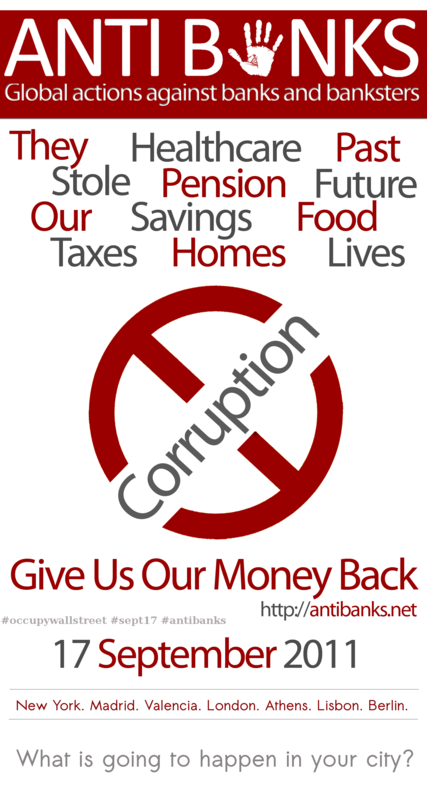 We are mobilizing because we know who pulls the strings behind our governments, central banks and international financial institutions. We are also mobilizing because we know that the last three decades -- since Reagan and Thatcher embarked upon their neoliberal crusade with widespread capital account liberalization and radical financial deregulation -- have seen the most frequent and most severe financial crises in history. Indeed, we know that the current 'state of emergency' is not the exception but the rule; we know that East Asia, Argentina and countless others have gone before us. We are mobilizing because we know that while hospitals are being closed, pensions cut, state assets privatized, cultural budgets slashed, workers’ rights abolished, and tuition fees raised, the banksters ran away with record profits and record bonuses last year -- higher than other year in history. We are mobilizing because we know that we are not in this all together; we know that a tiny fraction of society is directly gaining from the immiserization of everyone else. We are mobilizing because we know that even the tiniest of taxes on financial transactions -- a so-called Tobin tax, or Robin Hood tax -- could easily pay for the social services that are being cut “out of necessity” right now. We are mobilizing because we know that austerity is a mere ideological ploy, that it’s all a big hoax, that we are being conned. Yes, we know that this is the greatest bank heist in history, and we know that it’s the bankers doing the robbing. But we also know that there is an alternative: we know that cooperative banks, which are collectively owned by their customers, have weathered the crisis better than any other; we know that, prior to the abolition of the distinction between investment banks and retail banks, banking crises were far and between; we know that small credit unions have a much better record in promoting thrift and investing in small business than the large financial conglomerates that dominate the present landscape; we know that, by re-instituting capital controls, we can greatly diminish financial volatility and render the 'exit threats' that give the banks power largely meaningless. And, finally, we have all read the news about Iceland: we therefore know that it is possible to hold the banksters to account for their criminal behavior; we know that it is possible to lock up the directors of even the largest and most successful financial institutions; we know that, with sustained pressure from civil society, with mass mobilization, and a grand outpouring of popular discontent, we can shift the dynamics of financial dictatorship back towards democracy. Indeed, we are well versed in the tactics of non-violence and the art of civil disobedience, and following the honorable Dr King, we know that the arc of the moral universe is long -- but that it bends towards justice. So for these and countless other reasons, we will take back the streets this Saturday, September 17th, in a grand bid to reclaim our democracy from the dictatorship of financial capital and the ruthless logic of the market. Wherever you may be, we hope to see you there. #TOMALABOLSA in Madrid, Spain – Read the plan of action. Fb event. #TOMALABOLSA in Barcelona, Spain – Read the plan of action. Fb event. in Portland, USA – Read the plan of action. Fb event. in Porto, Portugal – Demonstration in front of Stock-Market headquarters. Portugal –Fb event. in Paris, Place de la Bourse, France. Fb event. Submitted by Paul Repstock on Sat, 09/17/2011 - 23:02. After the initial hype. After the twitter streams from faraway places like Tahrir Square and Benghasi, and Bharain...I'm stunned that there is no talk, not even a mention of New York and Portland or Austin?????? Are we under a gag order? Or just new management? Perhaps pragmatism has been adopted? I recognise that if this is the case, it must ave been a sudden conversion..There are no Corporate adverts in the sidebar yet. Paul signing out..praying for yur continued good health and Freedom. Submitted by Paul Repstock on Sat, 09/17/2011 - 22:59. Is New York less interesting than Tahrir Square?? Submitted by Paul Repstock on Sat, 09/17/2011 - 07:23. Do not count too heavily on the power of the people in this short term. Our enemies have the ability to burn down our human house if they feel threatened. Certainly, there are many in government and even among the ranks of the wealthy who would attempt to counter such a move. But as JP Orient detailed in the "Ex Nihlo" article, much of our fate rests in the 'hands' of machines. If these machines should be turned to malevolent purposes the effects would be devastating. The wellfare of the world rolls on money. A disruption of money could halt all services and supplies within 48 hrs. I'm not saying that we should surrender, just don't underestimate the enemy or their power. Whether some will admit it or not we have seen that power and that will demonstrated. And while you demonstrate and blockade, spare a moment to remember those parts of the world which already exist under the results of the financiers edicts. In spite of propaganda there is no necessity for half the world's people to be chronically hungry. Submitted by AIS (not verified) on Sun, 09/18/2011 - 02:02. ...that Caesars army stays on the other side of the Rubicon because he sure does have a fearful machine. Submitted by Paul Repstock on Sat, 09/24/2011 - 02:56. Because you understand and are concerned about this possibility, I would like to talk with you more about this and the 'Gold Standard'. Your account does not allow me to contact you directly. Submitted by Paul Repstock on Sun, 09/18/2011 - 03:53. Aye. there's the rub my friend. That is why this needs to be resolved now! Bridges burned can be rebuilt. Bridges crossed cannot be uncrossed. The consequences are too horrible for any to contemplate. That would be an inglorious end for a great nation.